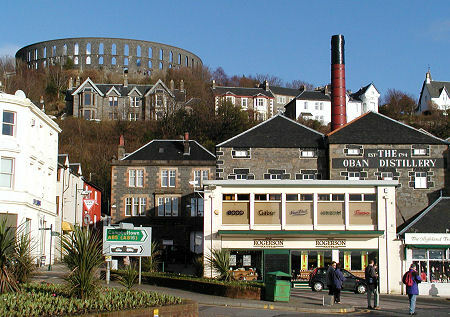 Oban Distillery stands in the very heart of the town of Oban. 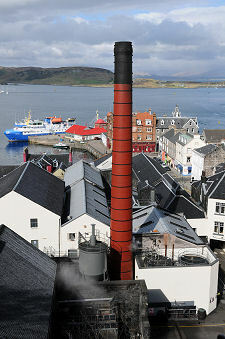 The best views of it are seen when you look back from the North Pier, when the distillery buildings come into view above and behind the shops along the landward side of George Street: topped off with a distinctive black-banded and tipped red chimney. Few distilleries in Scotland are quite so urban in location and Oban Distillery's site is hemmed in by the rest of the town on three sides, and by a sheer rock face at the rear. Oban can justifiably lay claim to being the capital of the western seaboard of Scotland, and is very popular with visitors to Argyll more widely. The distillery's location within the town makes a very popular visitor attraction, especially on days when the sun isn't shining. As a result, it is quite possible that Oban Distillery is among the most visited of Scotland's distilleries: and it certainly seems likely that it is the distillery most often visited by people who have never been to a distillery before. You'd hope that a distillery which received lots of visitors who were new to distilleries would go out of its way to act as an ambassador for the industry: and help sell the idea of distillery visits more widely to its guests. On this score Oban Distillery does very well indeed. The quality of the visitor experience has led to its being designated a 5 Star Visitor Attraction by Visit Scotland: and the combination of excellent guides and a compact and relatively easily understood distillery make for an interesting and informative visit. Your visit starts in the visitor reception and shop, which is accessed through a door from Stafford Street, the street immediately to the north of the distillery. This is an attractive area, whose designers have ensured that the building's origins as a warehouse (or was it part of the maltings?) remain obvious. Behind the reception area is a large exhibition space, given over to the story of Oban Distillery and of the town that grew up around it. Visitors gather here for the tours. 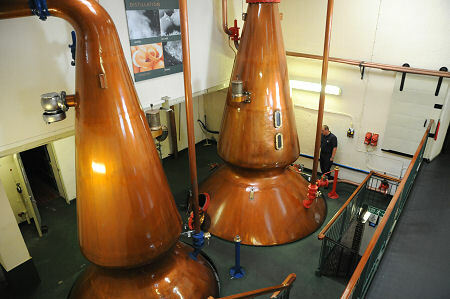 The distillery tour leads you through all the main stages in the process undertaken on the premises. 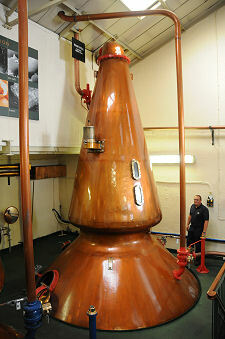 You can find out more about Making Malt Whisky from our series of feature pages showing the stages in the process. Like most distilleries, Oban no longer malts its own barley. Instead, malted barley is brought in, and the process starts with it being milled. At Oban a redundant Porteus mill stands at the heart of a display showing how this works. The mash tun has a stainless steel lid and is clad in what appears to be copper. The interior is lit so visitors can see what is going on inside through a transparent hatch. A neighbouring room is home to the distillery's four washbacks. Here, too, the interiors are lit to allow visitors a clearer view of the processes taking place within: it is this sort of detail which helps make Oban Distillery such a good place for first time distillery visitors. By this point in the tour, you are beginning to get a sense of just how deceptively compact the distillery is, and this is confirmed in the still room, which is home to a single pair of stills. If there is an award for the best presented stills in a Scottish distillery (though as far as we know there isn't), then Oban Distillery would definitely be a strong contender. What is especially striking is the breadth of the neck of the stills, and the emphasis of the pinch between the neck and the body of the still. Details like these effect the way the spirits are formed and flow within the still, and contribute to the character of the final product. Not visible is an unusual feature of Oban Distillery. The lyne arms taking the spirit away from the stills exit through the still room wall en route to worm condensers housed high in the roof space of the building. Not many more than a dozen Scottish distilleries still use worm condensers (where a spiral of tubing is housed in a tub of cold water): but we don't know of any others were the worms are located in the roof. The tour then moves on to the filling store, where casks are filled with spirit, before concluding in the tasting room. Here you can discover why Oban Distillery's single malt scotch whisky has formed part of the Diageo's "Classic Malts" collection since 1988. Oban Distillery was founded on this site by a family of local merchants, the Stevensons, in 1794. Oban itself was just a small fishing village until the steamers of the early Victorian era started arriving in ever greater numbers. It subsequently became the main point of departure for the Western Isles and a regular stopping-off point for the steamers linking Inverness with Glasgow via the Caledonian and Crinan canals. And the arrival of the railway in 1880 only confirmed its growing status. Within a century, the distillery found that the town had grown up around it. When the whisky writer Alfred Barnard visited in 1886 he found "a quaint, old fashioned" distillery covering two acres. He goes on to slightly contradict himself when he reports that the owner at the time, James Higgin, had recently built new bonded warehouses and offices, and "also made vast improvements in the machinery and appliances". At the time of Alfred Barnard's visit the distillery had its own maltings and kiln. Other differences included the presence in 1886 of seven washbacks. In the 1890s the distillery was briefly owned by the Pattison Brothers. They were whisky merchants based in Leith whose fraudulent manipulation of the whisky market led to what has become known as the Pattison Crash in 1898, which in turn caused a recession for the whole Scotch whisky industry that lasted for more than a decade. In the aftermath, Oban Distillery was purchased by Aultmore-Glenlivet Distilleries Ltd, and in the 1920s it was in turn taken over by John Dewar & Sons and Distillers Company Ltd. The distillery was closed between 1931 and 1937. A new still house was built between 1969 and 1972, since when the distillery has been in continuous production, now as part of Diageo. The visitor centre was added in 1989. Oban Distillery, Oban, PA34 5NH.